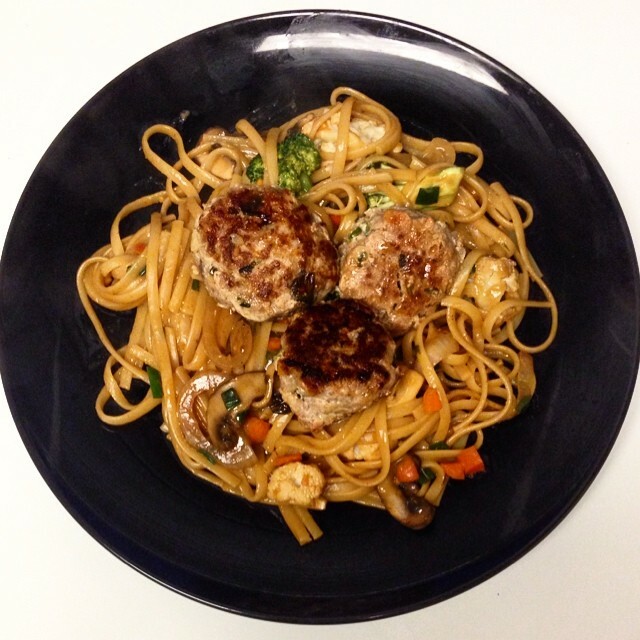 Fusion Time: Asian Spaghetti and Meatballs – Pao Says, "Open Wide!" I was in the mood for spaghetti and meatballs, but I had no tomato sauce. This is a rare occurrence for me, you must understand, but I wasn’t going to let that stand in my way. What I did have was some ground turkey, pasta, and some vegetables. I can make this work. Process- combine all of the ingredients and use your God-given mixers (your *washed* hands) to make sure everything is incorporated. Roll out the meatballs and place them on a sheet of foil or wax paper. I usually make these slightly bigger than a golf ball. Coat the bottom of a large pan with vegetable oil and cook the meatballs… takes about 3-4 minutes per side depending on the size of the balls- just make sure they’re cooked all the way through. Cook the linguine in salted water. While it cooks, begin to sauté your vegetables in a large saucepan that has been coated in vegetable oil. Once the vegetables begin to cook (look for slightly translucent onions), toss in the soy sauce. Add about a tbsp of hoisin sauce and a spoonful of peanut butter along with the amount of sriracha that would make you happy. At this point, I add in maybe 1/3 cup or so of the pasta water- it helps break down the peanut butter and helps make a creamy sauce. Once the pasta is al dente, throw it in with the sauce and veggies. Magical. Place your lovely hand-crafted meatballs on top of your pasta and enjoy!